The RBI has taken a unanimous decision to cut its key interest rate by 25 basis points and eased the stance of the policy from 'calibrated tightening' to neutral, indicating that rates were unlikely to go up. 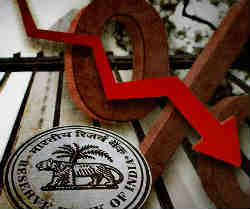 Despite the Union Budget being seen as expansionary and fueling demand by some, RBI said that while the proposals are likely to boost aggregate demand by raising disposable incomes. The full impact of some of the measures is likely to materialize over a period of time, RBI governor Shaktikanta Das said in his monetary policy statement. The repo rate is reduced by 25 basis points from 6.5 percent to 6.25 percent with immediate effect. Consequently, the reverse repo rate under the LAF stands adjusted to 6.0 percent, and the marginal standing facility (MSF) rate and the Bank Rate to 6.5 percent,” the statement said. The MPC also decided to change the monetary policy stance from calibrated tightening to neutral. When the RBI cuts repo rate, banks are expected to pass on the benefit to their customers. If the banks decide to pass on the benefit of repo cut rate, then the auto, home, and other loans are likely to get cheaper.